As president of Port Huron Ear, Nose, and Throat, Dr. Frank Brettschneider builds on more than 30 years of practice experience. 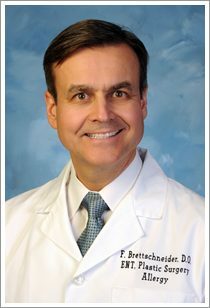 Dr. Frank Brettschneider regularly treats patients with acute or chronic sinusitis. Treatment of sinusitis depends on its duration, severity, and cause. Patients with bacterial sinusitis can benefit from a course of antibiotics, though some physicians believe that such infections are rare and that antibiotics are unhelpful for the majority of sinusitis sufferers, whose condition is more likely to stem from viruses or allergies. Those with sinusitis due to allergies may find relief through antihistamines or allergy shots. Some symptom relief may be achieved through painkillers and decongestants, the latter of which can help to thin collected mucus and improve drainage. Patients may achieve a similar effect through nasal irrigation, warm heat, or steam vapor inhalation, although those with severe swelling may require a prescription for an inhaled or oral steroid. If a patient’s sinusitis recurs or endures for an extended period of time, surgery may be necessary. Performed either endoscopically or through a traditional incision, surgery aims to remove blockages and encourage the sinuses to drain. Finally, some patients may be eligible for an alternative surgery known as balloon sinuplasty, which allows the surgeon to effect incision-free drainage using an inflatable catheter.